Good morning! I'm excited to be participating today on a special Holiday Cards blog hop with Pinkfresh Studio to help get you in the Holiday Spirit! As part of this celebration - this special die cut is FREE with ANY purchase while supplies last! It will be added to your cart automatically - so head over HERE to go shopping! 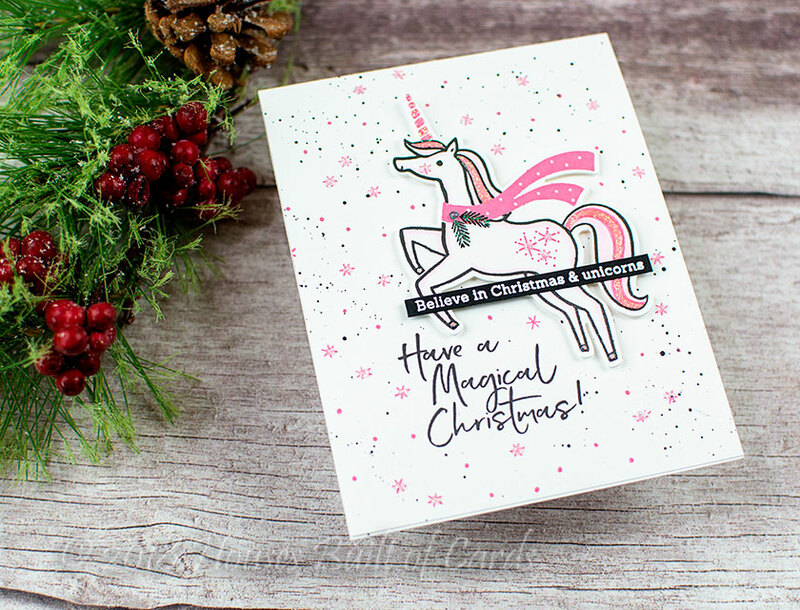 Today I'm sharing a magical pink unicorn card! Isn't that exactly what you think of when you start on your Christmas cards? Haha! So fun to make though! 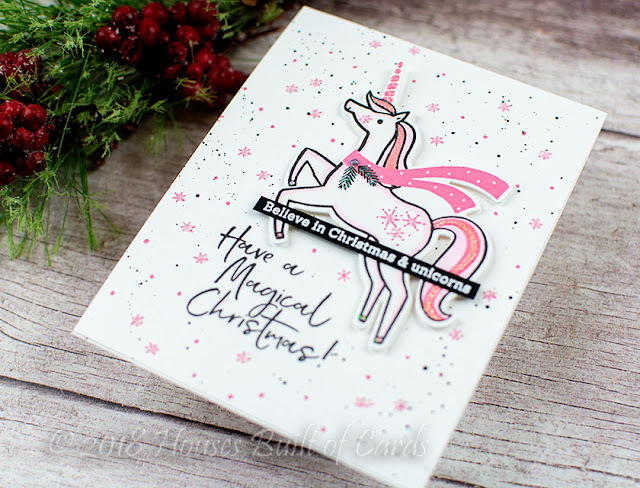 I started by die cutting and stamping the unicorn from Magical Christmas, using the coordinating Magical Christmas Dies. I added some extra images stamped on the body of the unicorn, and just a touch of pink Copics to color part of it in. I stamped my large sentiment, then chose some of the tiny images from the stamp set and stamped them in pin on my background around the area I planned to mount the unicorn, and then added some black splatters with my Licorice Liquid Watercolor - masking off the sentiment for that part so it wasn't messed up. I finished off by mounting the unicorn with foam adhesive, adding lots of sparkle with some glittery clear Nuvo drops, and then head embossed an additional little sentiment on a thin strip of black cardstock and mounted it over the top! 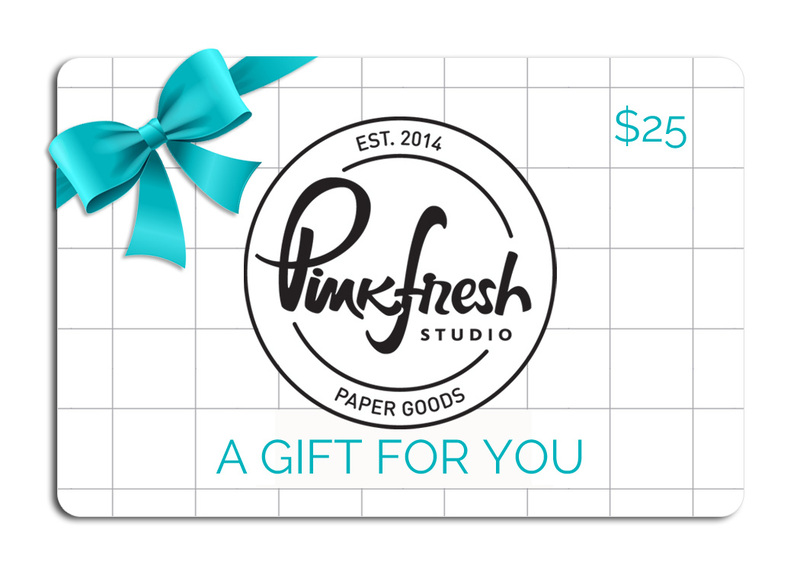 Make sure and leave a comment before you leave for a chance to win one of SIX $25 gift certificate to Pinkfresh Studio! There is also a prize pack up for grabs on the Pinkfresh Blog! Winners will be chosen and posted on the Pinkfresh Blog on Sunday, November 11, 2018 - so make sure and check back to see if you were a winner! Winners must check that page and claim their prize within 2 weeks. Your unicorn is absolutely magical, Heather! The pretty pink scarf, complete with a sprig of holly, the starry, snowy sky, the sentiment strip...a lovely combination! Christmas spirit soaring in seeing this inspired, inspiring festive delight! So adorable!! I love the pinks and the tiny details in the background. Very cute card!! My niece would absolutely love this card! Pretty in Pink ! I should get my Copics out too, I forget about them :D Thanks for inspiring! Well, this is certainly a magical card, Heather. Love the pink!! 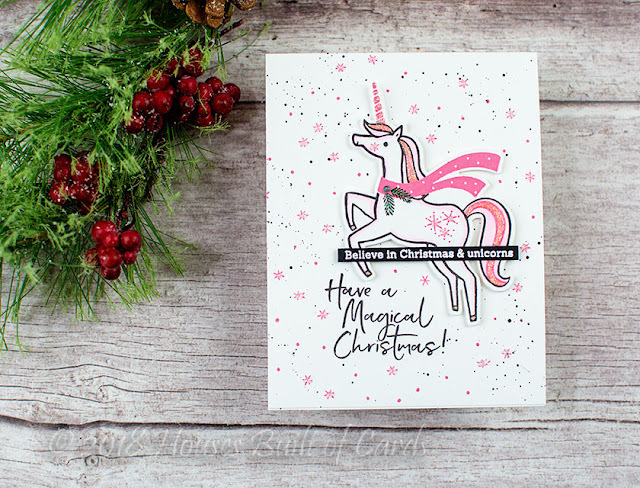 Loving all the pink details on this magical unicorn holiday card! That’s so cute and loving the pink! Pretty in pink.... Love how graceful looking this unicorn is. Nicely done. Wow, great card! Love the pinks. And I really love this stamp set. Fantastic card with this magical new set, thanks for sharing!!!!! Love your card and your mission! I really like the detail in the background. Thanks for sharing. Adorable card. Love the unicorn! So cute. I like the background and the sparkle. This is my fav! A holiday unicorn!!!! Love the detailing on this card. You used my favorite color-pink. Darling unicorn card...so pretty in the colors you chose. That unicorn is so pretty! I love that you used pinks for her and not the traditional Christmas colours - such a beautiful, feminine touch! This card is adorable, and so girly! I love this whimsical unicorn for the holidays! Such a happy unicorn! Love the pink and the background is so sweet, too. Your card is SO pretty! I love this happy unicorn stamp, and you have made it look so amazing too! Love it! Your Christmas unicorn is fab! Love the background you made for it. I love the little pine branches you added to the scarf. Great finishing touch. Love this Heather and YES,Christmas is magical (especially if you have young children in your life). This card definitely fits the bill! Such a cute card! Love the touches of sparkle and the tiny images in your background! This card is so cute! :) I just love that unicorn! A sweet card. A great looking background. A magical card - love all that pink! This unicorn is one of my favourites, and I love your card - such a fantastic design, and great colour choice! So pretty in the pink and white, with just a touch of green in the sprig. Beautiful! That unicorn is adorable! And I love the sentiment. Wonderful card! Beautiful, happy and so festive. Pink unicorns are so awesome! Love this! Elegant. Love the pink scarf and horn. Love this fun pink color scheme, so cute and whimsical. So pretty in pink! Love her fancy tail :)! Such a cute card! I love the pinks and all those stars! Hi Heather. Love your unicorn card. Am loving all the gorgeous stamps in this release. Thanks so much for sharing with us. Wonderful card! So full of fun and magical merriment. Fab card!! I love the pink unicorn!! So easy to customize it!! What a magical card! I love the background you created for the card, and the colors you chose. 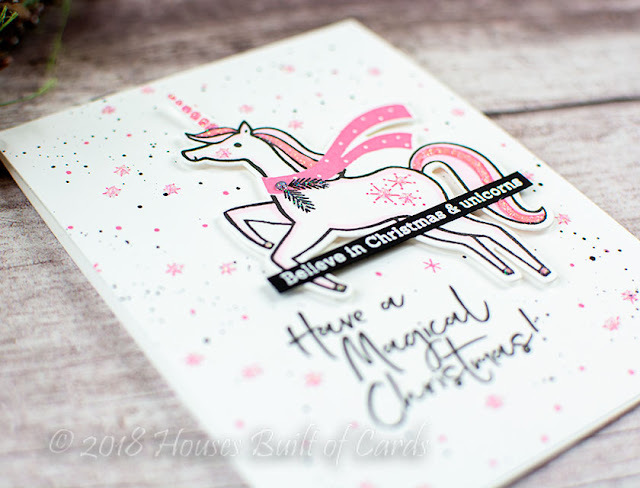 Adorable unicorn card - I love your pink and black palette too! Love your beautiful unicorn and this background! SO pretty, fun and magical! Beautiful job! What a beautiful card. Love all of the pink. This is really fun. My niece is going through a (mandatory?) pink phase, so this might just be her ideal card. Thanks for sharing with us! I just love your magical card, & the pink unicorn is so creative. It's just perfect! Love your sweet pink unicorn card! Love the Unicorn, and the added stars on the back flank really adds to the adorable look!!! Great cards!!! What a fun Christmas card! The unicorn is so pretty and I love all the pink. Definitely a magical card! Adorable card! Love this sweet unicorn set! I just love the glitter on the tail, it looks so magical. Very pretty! Such a pretty card. Love the whimsical look! I really like the sentiment font! Unconventional colors but what a pretty card! Love the added touch of stars on the unicorn! Thanks for sharing. Love the pink on here! I loved that stamp!! It was so cute!! I love your card, my granddaughter would too! !